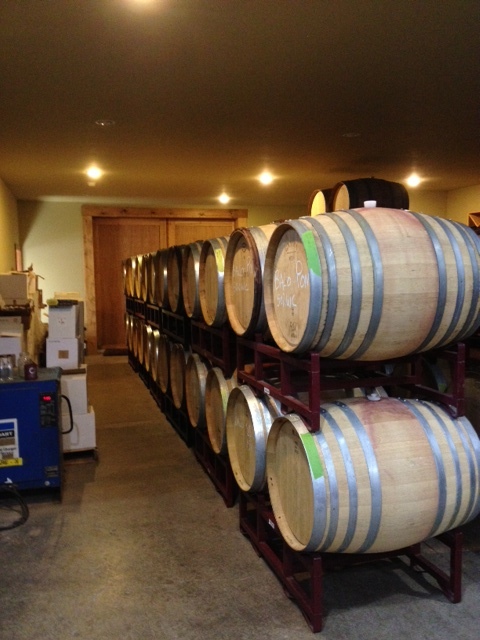 A trip up to Drew Family Cellars on a recent visit to the Anderson Valley left me a little awestruck. Not only were the wines great, but the Drews’ beautiful property was stunning. The drive was long and winding up to the top of the ridge, where the vineyard and winery were perched, with a distant view of the ocean. Drew Family Cellars has quite a reputation. It’s got some amazing Pinots that have continually garnered respect and big scores from the influential critics. 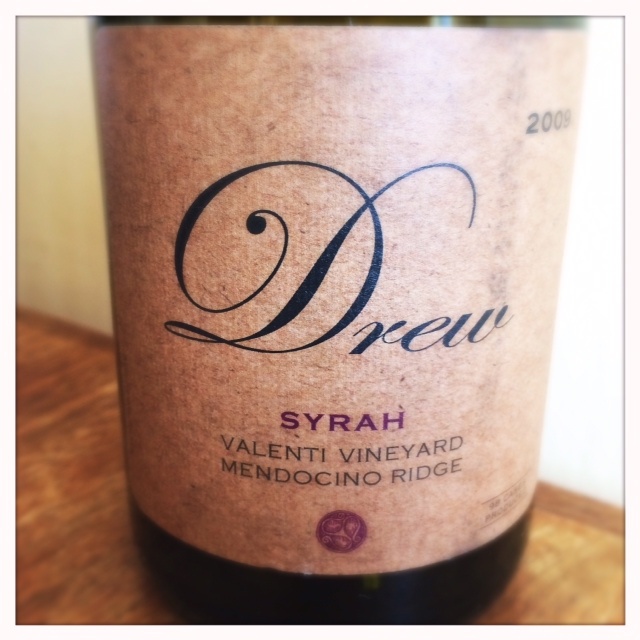 I’d been to Drew’s tasting room near Philo in Anderson Valley before and I’ve had a few bottles of the Syrah so I know that those scores are well deserved. These are impressive wines known for a structure and acidity that makes them eminently ageable. Drew Family Cellars’ wines are sourced from the Mendocino Ridge and Anderson Valley appellations. The Mendocino Ridge appellation runs upon the ridge that lies between the Yorkville Highlands and the Anderson Valley and the coast. It’s the only appellation in America that isn’t contiguous because it’s also based on elevation rather than just location. The valleys and lowland areas of the appellation just aren’t suited for grape growing because they are often shrouded in summer fog. Only the tips of the ridge where the sun shines are included in the appellation. Jason met us as we pulled up. His old blind corgie who seemed to want to get in the way of our car but we managed to avoid him. Obviously running over the family dog (whose name we later found out was Grizzly Bear) would not have been the best way to start off. Crisis averted, Jason and I talked about a family friend, Jeff Baker, with whom Jason used to work when he was a vineyard manager at Carmenet Winery in Sonoma, back in the 90’s. 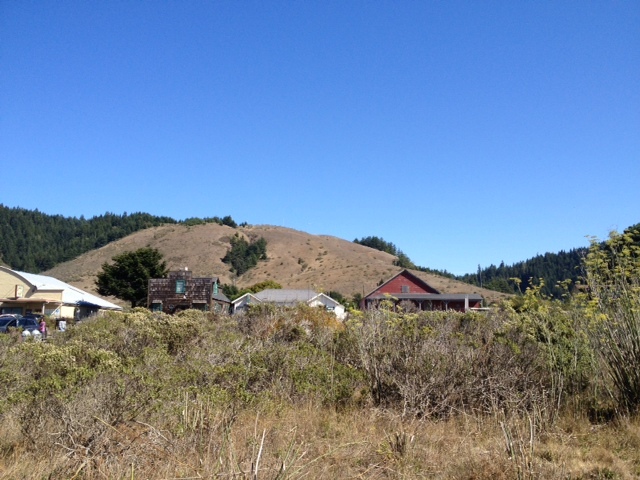 We reminisced a little about the past and then headed out to take a look at the property. One of the most amazing things about the Drew Family winery is that you can actually see the ocean from it. 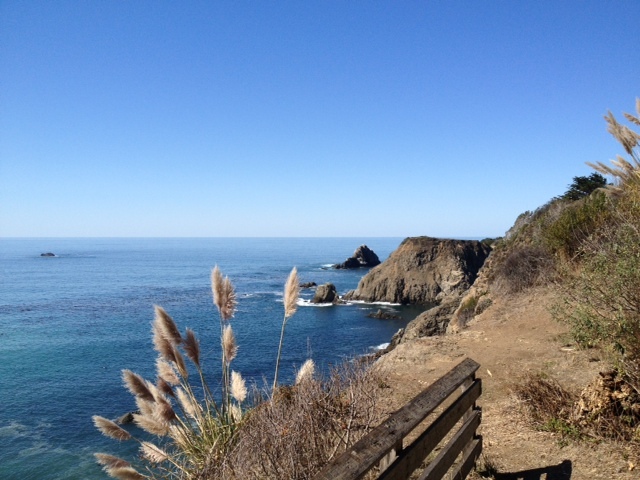 Many wineries talk about being close to the coast and its influence but few actually can boast of an ocean view. Jason has planted about seven acres of Pinot Noir around the property and expects to begin harvesting the fruit from these home vineyards next year. The vines are organically farmed as is the adjacent apple orchard, from which he sells apples to a local distillery where they turn it into brandy. Jason is using some biodynamic methods there and hopes to eventually convert the vineyards into a full biodynamic property in the coming years. 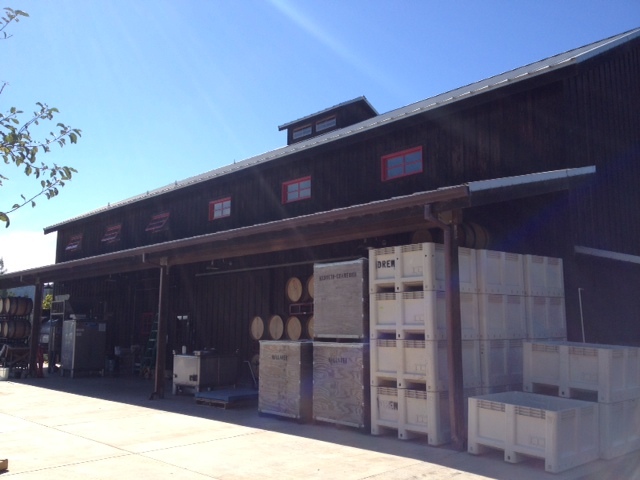 We headed into the rather impressive winery facility among Jason’s surf boards and kayaks and began tasting the Syrahs. We started with a 2011 Perli Vineyard Syrah which, although part of the Mendocino Ridge Appellation, was actually grown closer to the Yorkville Highlands than Anderson Valley. The Perli (as well as the other ‘11s) was really tight. At about 40% whole cluster the wine had a lot of structure. It also had a lot of pepper and earth but the wine didn’t have much expressiveness yet. This wine just seemed too young. The 2011 Valenti was pretty much the same, with beautiful structure from the 100% whole cluster, and with great acidity and tannic structure. Again, this is a wine that still needs some time in bottle to round out a bit. Jason believes the Syrah grape is a great candidate for whole cluster because that can dial back its tendency to become overly fruity and flabby. He thinks that the fruit is always going to be there but the challenge (at least in California) is to keep the wine structured. The 2009 Valenti was the star of the tasting and I brought a bottle home to taste and get to know better. This wine shows how Jason’s wines, when given a little time, really begin to open up aromatically. Granted 2009 was a warmer year but Jason believed that the ‘11s would also develop aromatically if given more time. In the ’09 all of that structure and acidity of the 2011 is still there, but it’s developed beautiful aromas of plum, black olive and gravel. The mid-palate still has a fair amount of acidity and verve but its energy has grown a tad more discreet. The finish has a gripping spike of acidity and tannin that speak to the fact that this wine will continue to age quite well. All of Jason’s wines have great aging potential. I let the wine sit on the counter for the night to see how it changed and found that it definitely benefits from some air. That plum was still there but the black olive aromas were even more defined. I got some strawberry and black cherry aromas mixed with licorice and fennel. The mid-palate rounded out a tad and the finish was a lot rounder. 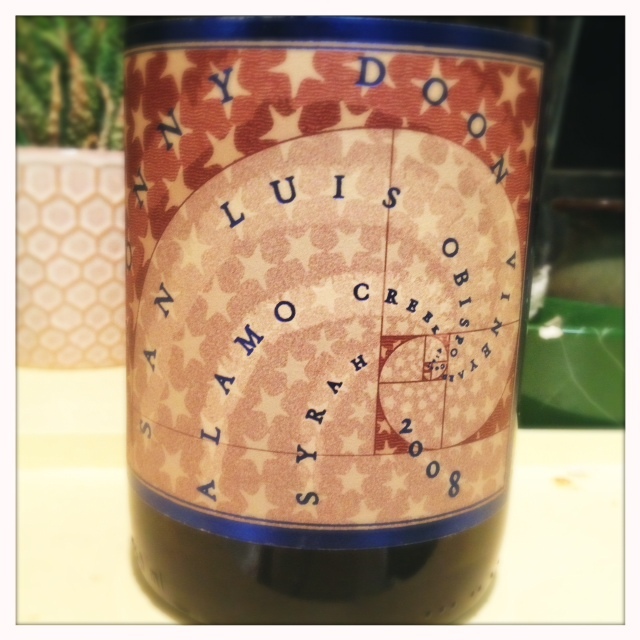 After a day on the counter it was just about the most perfect Syrah I’ve ever tasted. The idea of wines developing over time is a big deal for Jason. He doesn’t think that a wine should be too expressively open at the time of bottling because if it is, it probably lacks structure. He picks grapes when they are on the upswing towards ripeness but have not quite reached their apex. The wine should open like a rose bud, blossoming over time to reveal its charms. Jason further explained, “If there’s a fine line between ripeness and under ripeness I’d rather be right under that line.” As you can imagine, all of Jason’s wines are under 14% alcohol. Jason also doesn’t want to add acid to the wines because he believes it simplifies them and he wants to bottle them in all their glorious complexity. 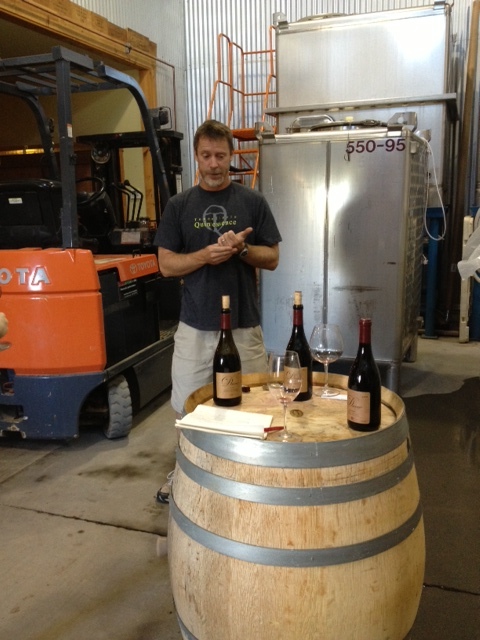 To enhance their complexity he also prefers to bottle his wines unfiltered. He aspires to three precepts: (1) organic/biodynamic farming practices, (2) no amelioration, and (3) no filtering. He hasn’t quite reached these goals but he’s getting closer every year. For Jason, the perfect wine is a moving target and he doesn’t believe in using any set recipes, each vintage is different and influences the decisions he makes. This is how he feels winemakers can express their creativity, just like an artist who creates original pieces rather than one who paints by numbers. Jason Drew makes beautifully elegant and age-worthy California wines. They are some of the best wines I’ve had although I would suggest resisting popping their corks for a few years after purchase (or at least decanting) before drinking. As we left the winery down towards the coastal town of Elk (again barely avoiding Grizzly) my wife and I felt fortunate to have had a chance to talk to Jason and learn about how serious and thoughtful he is about the art of winemaking. The gorgeous beach in the town of Elk, only 10 minutes away from the winery. There’s wine in them thar hills. Looking back towards the winery. Thanks to Jason Drew for taking the time to meet with us. I’ve had only a few straight Syrahs from Bonny Doon Vineyard and I’m a little surprised at that considering Randall Graham’s the original Rhone Ranger and responsible for a lot of the attention that rhone varieties get these days in California. I jumped at the chance to try a few when they offered a 20% off sale recently and I’m glad I did. So much has been written about Randall and his somewhat esoteric yet intelligent marketing and business style. Seven years ago Randall pulled back from what had become a rather behemoth wine company and sold off some of his super market brands to go back to smaller more terroir-focused wines. The results have been somewhat mixed in the larger world but from the perspective of most wine insiders it could not have been a better decision. On first opening, I was a little surprised at how new world this wine tasted. I thought it was going to be more restrained and more savory. I enjoyed it but I was a little disappointed that it wasn’t the cool-climate gem that I thought it might be. Turns out it just needed some more air to let the earth aromas come out. After a night on the counter with the screw cap tightened, the wine released lots of black olive and pepper aromas. There was still a nice core of black cherry and blackberry fruit with a nice perfumed lift but it was couched in this beautiful minerality and savoriness that seemed absent on first opening. There’s a beautiful plum undertone and an exotic spice that I can’t quite place. The acidity on the mid-palate transitions into a good acidic lift. Wow, this is good stuff. I wish I had just opened it and left it on the counter the whole night before I drank it at all. If you buy a bottle I suggest that’s what you do.